A fun pink guitar book was submitted to the swap by Meredeth, known on Etsy as yatsu. In her own 3rd-person words: "Continuing in the theme of coffee-stained pages (yes, so yatsu slightly overestimated the number of pages needed for a couple of projects, let's just move on, shall we? 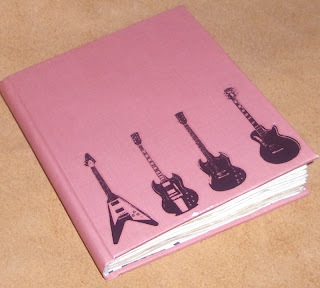 ), this mini Rock Star Book features wrinkly, French roasted goodness and flashy pink covers. The line up on the front consists of rub-ons, rub-ons and, wait for it, rub-ons. Check the inside covers for a little surprise! 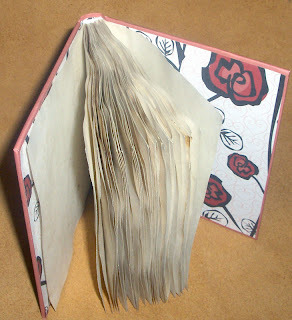 (... For those fourteen of you who did not receive this book, we'll spill the arabica: the endpapers are funky red roses.) Now get out there and get rockin'!" Visit Meredeth's Etsy shop to see more of her work. I'm simply stunned at the number of great books in the swap! oh i agree - it was really quite overwhelming when i had them all here!